It was a bit of a race for me: will I draw more fire hydrants or more churches? Fire hydrants was always going to win because of the ease/speed factor, but by day two it was neck and neck and if I hadn’t spent so much time schlepping up and down hills I might have spent that drawing even more Porto churches. There are so many beautiful ecclesiastical buildings in Porto, with accompanying dizzying views, sculpted masonry and often those very Porto-esque blue and white tiles. 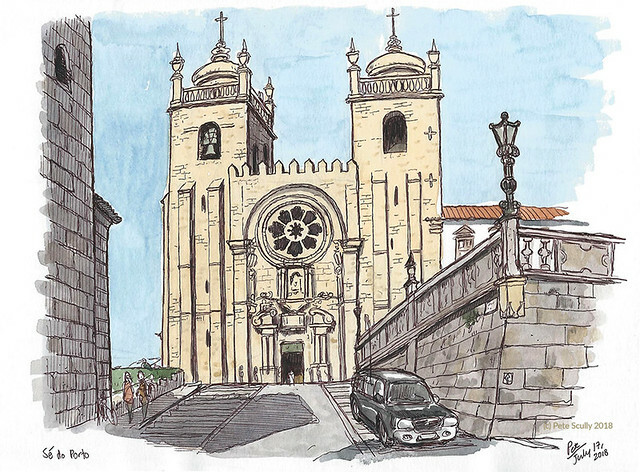 Above is the church of Igreja Paroquial de Santo Ildefonso, at Praça Batalha, which was right outside my hotel (I drew a map, below) and on the other side of a deep valley facing the iconic Torre Clerigos. A lot of sketchers drew this church. I never went inside, but I loved all of the tiles outside. 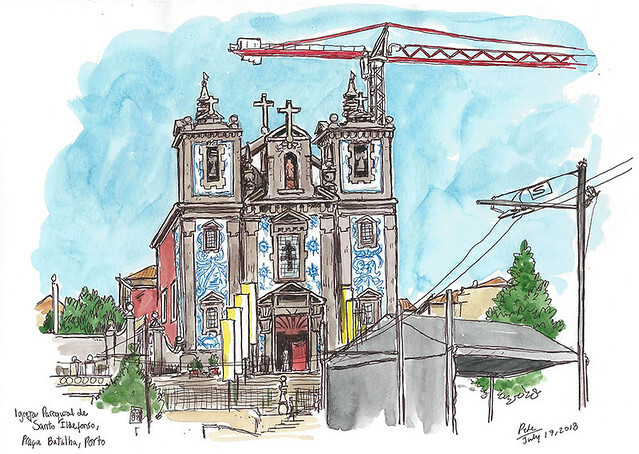 This was the first sketch I did in Porto, sat outside my hotel eating a couple of ‘Natas’ and drinking a Fanta Orange. Below is the Cathedral of Porto, the Sé, another magnet for sketchers, not least for its incredible views over the city. I do wish I had drawn it more than once from another angle, as I really liked the views approaching the cathedral from behind. I wanted that view of the front with the sun shining down on it. I stood outside some houses in the shade, looking up, a group of older Portuguese men stood to my left just chatting and smoking, and shaking hands with the occasional local passer-by, while an old lady sat outside her house to my right yelling at pigeons while another one (or maybe the same one, I wasn’t paying much attention) threw things at pigeons from an upstairs window while hanging out laundry. Ok, why am I drawing cathedrals? I should be drawing that. The Sé building dates from 1737. Now below is the one that, if you were an urban sketcher and didn’t sketch this at the symposium, you weren’t really there. Ok that’s how it seemed anyway. The Torre Clérigos was used as the symbol of the Symposium and was that one tall tower visible from everywhere. I sketched this one (below) on the last Saturday of the Symposium, making sure I managed to get it in before I left the city, forgetting I had actually drawn it three or four times already from a distance. It’s on a very, very steep slope which is great for the perspective sketching, and I sat in the afternoon sunshine with a wide-brimmed hat on to draw this. The Clérigos was built by renowned baroque architect Nicolau Nasoni, who designed many other grand buildings in Porto. Below was one of the more spectacular churches I saw. The building shape itself was not inspiring, but you don’t look at a painting and say, yeah but it’s just a rectangle of canvas. It was the amazing decoration, covered completely in smooth blue and white tiles, covered in beautiful ornate paintings. It was like the Sao Bento train station but inside out. I didn’t have time to go inside. I came across this church, while walking around late at night looking for an easier way back to the hotel that involved no mountaineering. By the way it is called the ‘Capela das Almas’ and is located on Rua Santa Catarina, opposite the Bolhao Metro station (Santa Catarina is actually one of the few I walked down that was actually a flat surface). 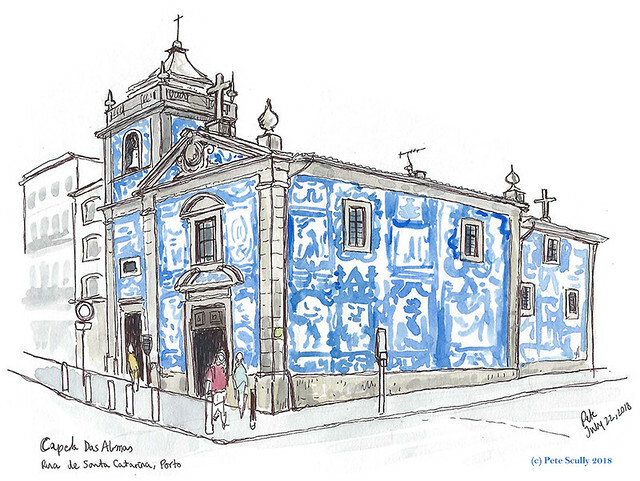 This church dates from the 18th century but the tiles were added in 1929 by Eduardo Leite. At night it was lit from outside and so it shone like a beacon, with all those smooth tiles, but I was tired so drew it in the daytime, my last sketch in Porto before leaving. In fact I only had time to draw the lines, I added the paint afterwards. This would be an amazing one to do a huge drawing of, spending a long time with intricate details, but I would need (a) better glasses, (b) loads more time and (c) loads more natas. There were so many other church buildings I did not get to sketch, such as this one below. Actually it is two, right next to each other, located near Porto University. Perhaps next time I’ll draw all the ones I missed this time. 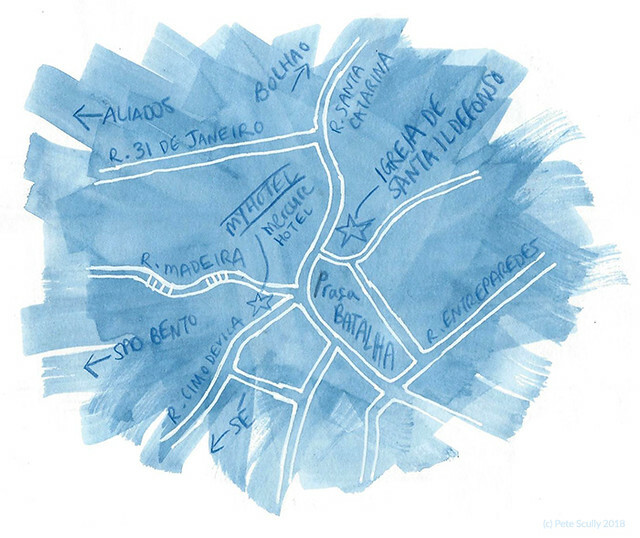 Stay tuned for more Porto sketches! Putting my hand up, I didn’t sketch the Clerigos Tower. 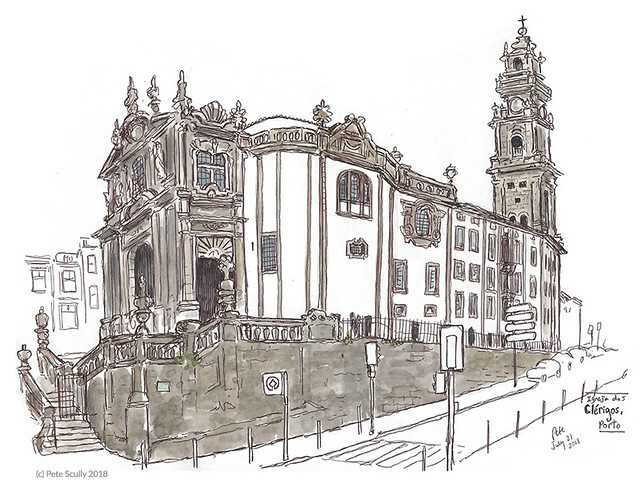 PS I loved the Porto churches as well and only managed a few sketches, not as many as I would have liked. There are so many! I would have loved to have sketched some interiors, but the time got away from me.